As those who know me, and if such a person exists, cyberstalk me know I created this blog after writing on another site, which shall remain nameless, for a while. The point is, I have material sitting around waiting to be re-used on occasion I will re-post them here. Some of those reviews may have been extemporaneous at the time but are slightly random now, hence the new title and little intro, regardless enjoy! This review pertains to the DVD release. The timing of the release of Pufnstuf, the motion picture adaptation made in 1970 of the popular TV series, was no coincidence. Across the top of the cover is blazoned from the producers of Land of the Lost. However, this kind of tie-in advertising on a cover can be misleading. Just from seeing the trailer and a few episodes of the original Land of the Lost series anyone can tell the two are vastly different. Land of the Lost box sets are likely likewise brandished “Now a Major Motion Picture.” Even though the series and the release are as dissimilar as The Brandy Bunch renditions were it’s not necessarily a bad thing it’s just another case of caveat emptor. 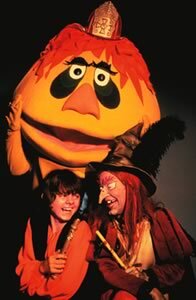 Pufnstuf, as a motion picture looks almost exactly like it did as a show, puppety costumes à la Sesame Street and some times two-dimensional set pieces. That’s what the show was. Having never seen the movie what’s great to see was the occasional cinematic device thrown in to spice things up, usually during songs like fast- and slow-motion, quick cuts (like New Wave speed), matte painting (some better than others), creative use of stock footage, image flips, cuts to orange (of all colors) and even a slightly canted shot or two. For film fans many of the voices, as you may or may not know are inspired by old movie stars, it’s the cartoon logic of funny for adults and kids but for vastly different reasons, examples being: John Wayne, W.C. Fields, Edward G. Robinson and James Cagney. For fans of the show it’s an old-fashioned origin story basically replacing the theme song and showing how it all got started and it even answered a few questions or went slightly more in depth like: how Jimmy and Freddy the Flute first met, why a British kid is on a crazy island full of anthropomorphic Americans and adding an outsider element to make the fact that he’s alone away from his family OK, if we ever thought of it. I also appreciate the fact that the parents didn’t appear, they were ghosts. As they should be in a kids story. The film features a pretty good cameo by Mama Cass, who of course sings but oddly you don’t mind the wait because she’s pretty funny. All the songs are pretty good and original to the film. Jack Wild carries most of them and handles them with his typical ease and flair. Typically, when dealing with a television show being turned into a movie when I have been a fan of the show. I want to see something akin to the best episode ever, if the film is intended to be a straight remake and not a reboot or spoof. What you get with Pufnstuf is just that, everything at its absolute peak. Billie Hayes is hilarious in what is definitely her best rendition of Witchiepoo. In an episode there would be cheesy jokes that would make you roll your eyes or sigh, a lot of the jokes here are still cheesy but they work. The only thing that comes close to it was the aired only once episode, which is on the DVD of the series, where mushrooms were eaten, no lie. The music and consistency of this puts it over the top. This DVD is a must for any Krofft fan who enjoys their creations as they were first intended, not how they’re being reintroduced to the world.